The indie whiz kid and his Mystic Valley Band channel the Eagles at their hometown Omaha gig. Click here for photos and a review! 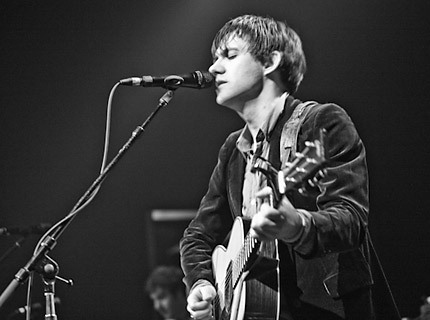 It was never fair when critics and fans dubbed indie boy wonder Conor Oberst his generation’s Bob Dylan — just like it wouldn’t be fair to call his latest group, the Mystic Valley Band, his generation’s Eagles. But still, the similarities are there. During the band’s hometown tour-opener Thursday night at Omaha, NE’s the Slowdown, a 600-capacity venue owned and operated by the folks who run Saddle Creek Records, each member of the group took the helm for at least one song, while Oberst played the role of enthusiastic sideman. Guitarist Taylor Hollingsworth was Joe Walsh on a short Beatle-esque pop song, bassist Macey Taylor was Timothy B. Schmit singing a twangy number that could have been off the ’70s hitmakers’ last album, while drummer Jason Boesel pulled a Don Henley, crooning from behind the kit as Oberst sang along off-mic. The songs from Outer South — the band’s sophomore effort due out May 5 on Merge — had the same country-rock crunch heard on their 2008 debut, and at times even conveyed a peaceful, easy feeling. After that, however, the Eagles metaphor breaks down — the legendary group never had one central character like Oberst to run things. Despite trying to make Mystic Valley more of a band’s band than another Conor Oberst singer/songwriter project, there’s no question who’s in charge, and who all the little girls pressed up against the stage came to see. During a break in the set, Oberst asked the crowd if they had any questions. “How do I make you love me?” one heart-struck girl shouted from the dark. In the old days, if you’d scanned the crowd at a Bright Eyes concert — Oberst’s other band (which played in Omaha just a month ago, apparently to crush any rumors of its demise) — you would have seen plenty of longing tears. But Oberst is now pushing 30, and with the Mystic Valley Band he’s taking a stab at a new sort of maturity. That also means no more chugging from a jug of wine between songs to emerge stumbling drunk by the end of the set. He seems to have cut out that excess along with his hair, and his music has emerged better for it. The nearly two-hour show featured 12 new songs, including a new set-closing psychedelic rocker in which Oberst did his best Dylan-goes-electric croon, snarling the line, “Girl, what good are you?” over Hollingsworth’s blazing guitar leads. Those who came for the quiet stuff were rewarded during the six-song encore, which closed with a poignant version of “Milk Thistle” that brought things down for the ride home. For a guy who’s been performing on stage since he was 14, Oberst has never looked more content than when he’s playing with the Mystic Valley Band. Still, he’s the kind of guy who never stays in one place — or with one band — for very long. So tell us, Conor, are you in this one for the long run?